Please accept my most prostrated obeisances at the dust of your lotus feet on the most auspicious occasion of your 122nd Vyasa-puja celebration. All glories to Your Divine Grace. Srila Prabhupada, this epic documentary in many ways epitomized what you have accomplished as the ‘exemplary ambassador of India’s ancient civilization’. HH Sivarama Maharaja, on this occasion from the same podium recalled that in 1977 a gentleman had glorified you by saying, ‘India is the place where Krsna is worshipped. Since Krsna is now worshipped all over the world by Prabhupada’s preaching, it is to be understood that Srila Prabhupada is India’s greatest ambassador.’ His statement elicited a big applause which triggered a thought in my mind. Globally wherever we find ISKCON, those very places are like an extension of Bharat-varsa (India). With the passing of time those “towns and villages” where your ambassadorship of India’s ancient civilization has been established, will expand, ultimately encompassing the whole planet. Srila Prabhupada, your Hare Krishna Movement has achieved the dictum, “the world tendency is towards one state or one human society’. It is the meeting of hearts, minds and thoughts. No other organisation could do this or has accomplished this. They may be talking of some kind of global brotherhood or peace and unity, but it’s all very superficial with no deeper understanding or commitment. Krishna Consciousness on the other hand makes us understand that all people everywhere are truly, factually and eternally brothers and sisters. When different persons claim that they are brothers, it means that they have someone in common – a common father, the Lord. The Vedic point of view vasudhaiva kutumbakam is that everybody on this planet is certainly part of our family. To consider some people to be His and others not, is a duality that is a reflection of low and miserly thinkers. The magnanimous, high thinkers think in terms of vasudhaiva kutumbakam – considering the whole world as His family. God does not make any discrimination or divide people by their boundaries, race or colour. They are all His people, His devotees. Godly devotees think like God. For you Srila Prabhupada, India was never a boundary on a map. The philosophy you propagated is vasudhaiva kutumbakam – nurturing and guiding ‘the world tendency of going towards one state or one human society’. You inculcated in us a mental attitude that harbours world human brotherhood wherein the world unites as one family. In an interview with Mr. Sharma, a United Nations worker, you stated that the United Nations are unable to accomplish anything. They were formed to stop war, and have been unsuccessful in their mission. You said, “The United Nation organization, they want to unite. For the last twenty years the United Nations are trying to unite, but the result is – we are disunited. Instead of making one flag, the flags are increasing every year. The United Nations has failed” During the public programs you would proudly point out, “This is my disciple from America. And this one from England. And this one from Germany.” Srila Prabhupada you said, “ We are all very fortunate that different nations, from different parts of the world, are now combined together in Krishna consciousness.” You brought all of us together under the one banner of Lord Caitanya. ISKCON is the United Nations of the spiritual world. The last Mayapur festival was attended by devotees from over seventy countries. All were united in spirit, staying harmoniously together under one roof; one kitchen, one family. There is much truth in the axiom ‘a family that prays together, stays together.’ We chant and dance together and all the differences, boundaries and designations disappear. The ISKCON family is growing from strength to strength. All the members and followers of the Krishna Conscious movement have one common scripture – ekam sastram devaki-putra-gitam – Bhagavad-gita; we worship one God, eko devo devaki-putra eva – the son of Devaki, Krsna; chant one mantra – eko mantras tasya namani – Hare Krsna Hare Krsna Krsna Krsna Hare Hare, Hare Rama Hare Rama , Rama Rama Hare Hare and universally we all have the same occupation – karmapy ekam tasya devasya seva – and that is devotional service unto the Supreme worshipable Lord, Sri Krsna. “The world tendency is toward one state or one human society.” Srila Prabhupada, that society is the International Society for Krishna Consciousness of which you are the founding father, the senapati bhakta of Lord Caitanya. 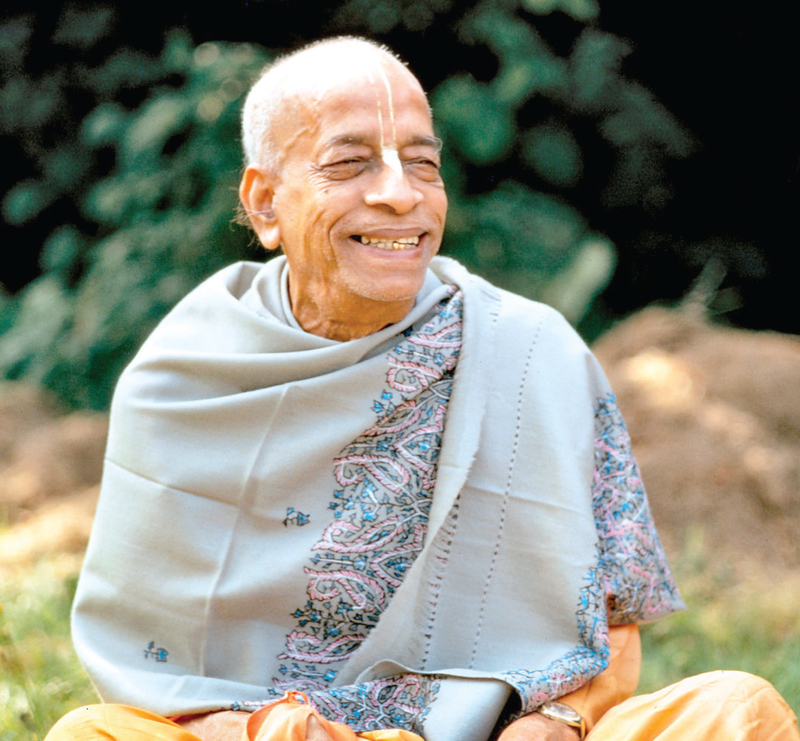 ISKCON founder – acarya Srila Prabhupada Ki Jai! !